Click here for a nationwide list of 100's of professional snake trappers! Most snake traps are glue-based traps, designed to hold the snake once it slithers over the trap. There are no effective snake baits or snake lures sold individually, but you can click here to buy a snake trap for snake removal, and this trap, which is my favorite one has a lure. In order to successfully trap a snake, type of trap and setup and location are the most important. Any person can buy a trap and set it (you'd be amazed at how many traps I see novices set completely incorrectly), but as with any skilled profession, it takes knowledge to do it right. For some animals, such as snakes, location can be extremely important. Presentation is a key factor, access to cover, sunlight, and many other factors all play an important role. The most important factors in successful snake trapping are that the trap be set in areas the snake is known to use, and that it is set next to a wall, since snakes typically travel along edges. Here we see photos of various snake traps that I've used over the years as a professional snake removal expert. At the top, we see closeups of the Snake Trap brand of trap (the yellow one), which has proven to be my favorite trap. It's durable and I can use it repeatedly. It also catches snakes at a much higher rate than other traps, likely due to the internal funnel design and snake attracting scent dots inside. It uses a special adhesive to hold snakes, and I've never seen an escape. In the middle is another pretty good trap, a cardboard and glue trap. The snake is stuck fast, as you can see. In the next photo is another Black Racer caught on the same type of cardboard glue trap. I am spraying Pam cooking oil on it, and it will soon work itself free from the glue. This kind of trap can only be used once. 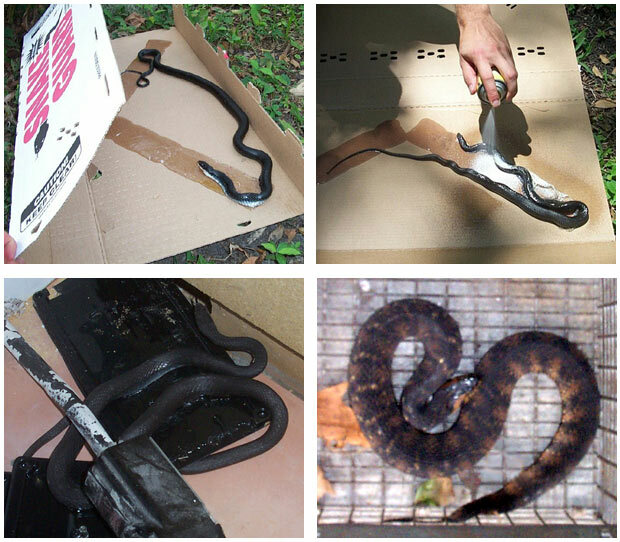 Next, in the lower left we see another Black Racer, this one caught in a house, on smaller glue traps set behind an oven. This type of trap is often not as effective or safe. Finally we see a snake caught in a funnel-type cage trap, which is the most durable, but has by far the lowest catch rate. All of these traps can catch a single snake, or several snakes if you have a snake infestation in your house. Much of the time, it's a better solution to physically catch and remove the snake at the time it is seen. A professional can do this, though I would not advise catching or handling any snakes unless you are absolutely certain of the snake's identity, and have experience handling snakes. Snake trapping outside is usually another option, and much safer. I usually only place snake traps around or inside a house, in a case when a snake is somewhere around or in the building, and can't be reached or found. Then snake traps are a great idea, and usually do the trick nicely. For more snake information, go back to the snake removal page. AAAnimal Control is a professional nuisance wildlife control company located in Orlando, FL We offer solutions to wildlife problems throughout the Greater Orlando Florida area. Services include animal trapping, capture & removal, plus animal damage repairs and preventative measures. You can always browse this site for more details and info. If you live elsewhere in the US and have found this site and need a local trapper in your area, click here for a nationwide list of 100's of professional wildlife control experts. How to get rid of snake by trapping - Chances are, if you want a few days, the snake you?re worried about will move along on its own. Many homeowners jump right to trapping if they see a serpent on their property when, in fact, many snakes are transient. However, with repeated sightings, you'll know that the snake is living in the area, and if you don't want it around, then you may want to remove it. If you do have a snake living in the yard, you can call a professional to have it removed or you can purchase a snake trap. Before you attempt to handle the snake on your own, you need to identify it. Knowing exactly what kind of snake you are dealing with is not as important as determining whether or not it is venomous. A venomous snake should only be handled by a professional. Do not ride to the challenge presented by a dangerous viper. It is not worth the fool?s glory of attempting to best the animal. One bite from a viper can do serious damage to your body and may result in death. If you are positive the animal is nonvenomous, you can attempt to pick it up while wearing gloves. Be sure to support both the front and the tail. Do not pick the snake up by its tail. This will only aggravate the snake and put you at risk for a bite. If caught in a trap, you won't have to worry about handling the snake.